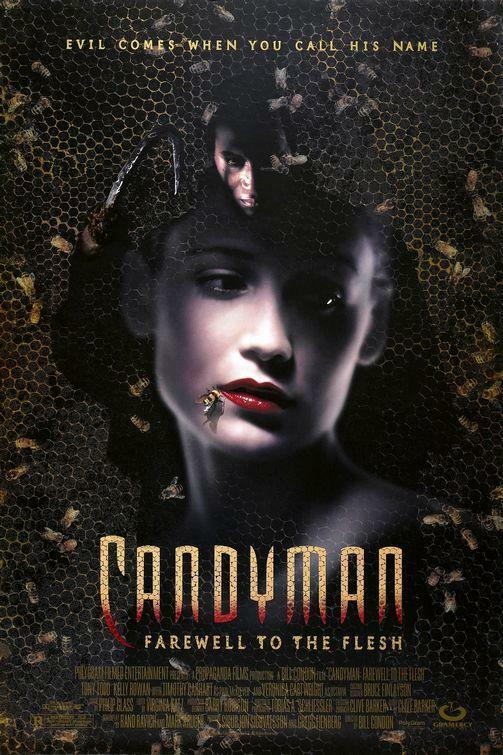 CANDYMAN: FAREWELL TO THE FLESH: Do Urban Legends Have Second Acts? – Schlockmania! Making a sequel is typically written off by casual observers as the easiest, most commercial thing for filmmakers to do. This is often correct in a financial sense: market the right redux of a concept to an audience that already loves it and they’re likely to buy it again. However, making a sequel is a challenge in the artistic sense, at least if you want to make a good one. You have to stay close enough to the familiar to bring in the fans of the original film while adding in enough new elements and interesting flourishes to keep the results from being a carbon copy. Candyman: Farewell To The Flesh represents an interesting example of the financial and artistic aims of the sequel trying to find a meeting ground. The script, based on a plotline devised by source material author Clive Barker, shifts the franchise’s urban legend concept to New Orleans. School teacher Annie Tarrant (Kelly Rowan) is a young woman whose well-to-do family has fallen on hard times: her father seems to have committed suicide under mysterious circumstances, her mother (Veronica Cartwright) is dealing with cancer and her brother (William O’Leary) has been arrested on a murder charge. Annie believes her brother is innocent and starts to research the mysterious murder. 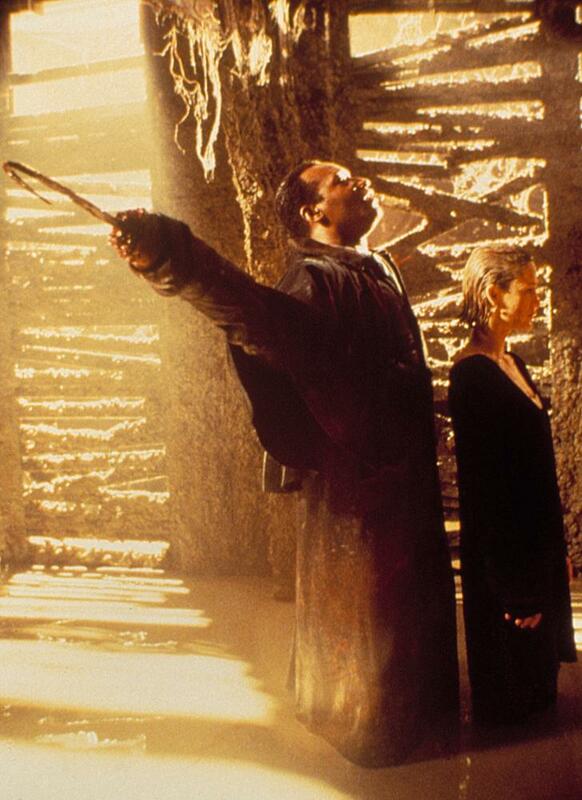 Everything circles back to the legend of Candyman (Tony Todd), a legendary supernatural killer who can be summoned if someone says his name thrice. Annie invokes Candyman to prove to herself the legend is fake but unwittingly releases him once more. As she tries to stop him and the bodies begin to pile up, she learns she might have more in common with Candyman tha t she might think – and the audience learns about the incident that made him such a terror. Part of the appeal of the original Candyman was its freshness: it offset its slasher and ghost story elements with a deeply-felt sense of social commentary that gave it a unique resonance and its then-new urban legend hook lent it a bit of added narrative excitement. Candyman: Farewell To The Flesh inevitably can’t offer such rewards as horror fans know the rules of the game by this point – and commercialism-driven sequel logic dictates that there must be an air of the familiar to keep the film in line with its predecessor. However, this doesn’t make Candyman: Farewell To The Flesh a rote retread. The Rand Ravich/Mark Kruger script adds a few novel wrinkles. For example, the city of New Orleans is effectively used as a character in the film, complete with evocative Mardi Gras visuals and a southern-fried disc jock ey who acts as a sort of Greek chorus to the story line. 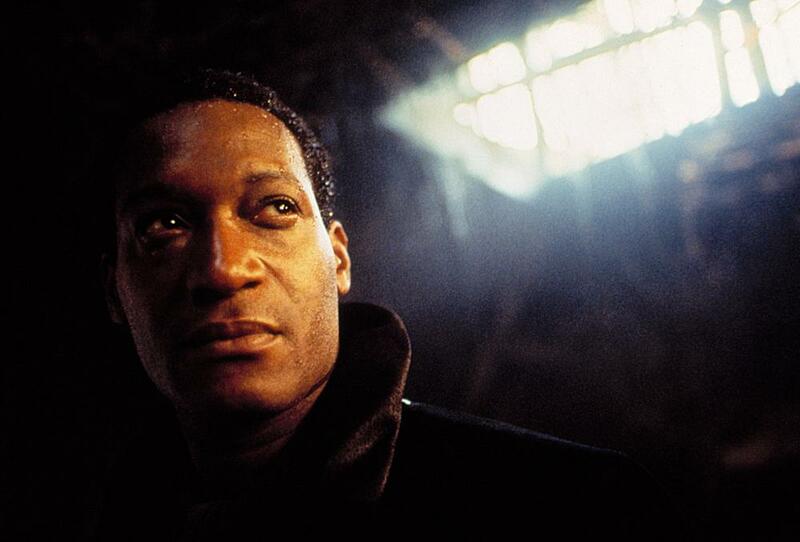 As it reveals the connection between the present day events and Candyman’s past, the script offers some barbed commentary on the scars that slavery has left on American society. Candyman: Farewell To The Flesh is also effectively crafted by director Bill Condon: he’s a little overly fond of jump scares during the first half-hour but creates several effective setpieces, including a police interrogation that goes awry in a memorable way and a stylish chase through a Mardi Gras parade. He really takes to the gothic romance element of the plot, which interestingly foreshadows his later work on the Twilight sequels. On a side note, it’s worth mentioning that the producers wisely got Philip Glass to return from the first film to create a new musical score and his elegant, choral-tinged work really amps up the film’s atmosphere that Condon creates. The performances are also solid: Rowan makes a decent heroine but it’s Todd who rules the roost here, bringing both chill factor and gravitas to a role that is ultimately revealed to be quite tragic. Cartwright has a lot of fun playing a bitchy southern matriarch and veteran character actor Matt Clark is also quite good in a bit role as an art dealer who sheds light on Annie’s past. In short, Candyman: Farewell To The Flesh never eclipses its predecessor but that would have been an impossible task under even the best circumstances. Instead, it offers a solid second act to the legend, weaving in a few inspired touches that make it worth a look for devoted fans of the first film. For a horror sequel from the ’90s, that’s a pretty good deal.